Veneers are thin but very strong porcelain facings that are bonded over the front of a tooth, making the tooth look flawless. Dr. Radu is highly trained with 30 years of experience making beautiful veneers. He is very thorough and makes sure his patients are happy with their results. If something isn’t quite right, he takes the time to do whatever is needed until you are satisfied with the result. Dr. Radu uses wafer thin e-max veneers, a metal-free, high quality porcelain that is strong, biocompatible, and resistant to stains and bacteria. Dr. Radu is experienced in placing minimal-prep veneers, such as Lumineers®. In some cases, he can also make no-prep veneers with high-grade porcelain that are very strong and look natural. Both of these methods require very little or no shaving of the tooth. 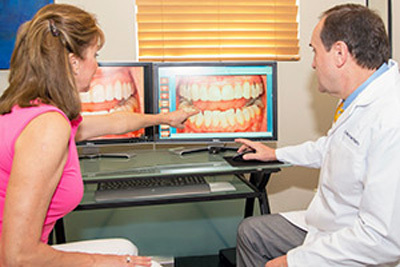 You will meet with Dr. Radu and go over your options for beautifying your smile in a free consultation. 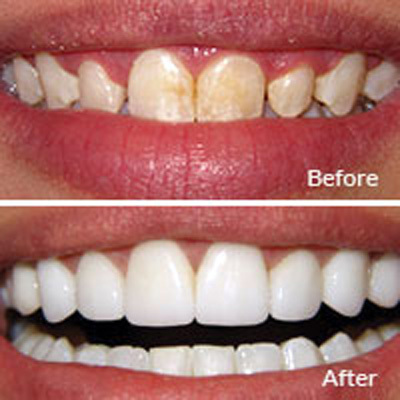 Stained and badly stained teeth can be easily repaired with porcelain veneers. Veneers are a fast and permanent way to obtain a more beautiful and appealing smile. Many unwanted conditions can be easily and quickly changed with veneers. After a thorough exam, Dr. Radu will create a wax-up of your teeth in order to show you just what the final result will look like before any work on your teeth is begun. You will work directly with Dr. Radu on the design of your new veneers so they come out just the way you want. You will be involved in the process of choosing the shade of the veneers so that they blend beautifully with surrounding teeth. The shape that looks best will also be chosen. For example, you may want the Hollywood smile (perfect, bright teeth) or simply a beautiful, more natural look. Dr. Radu uses an iPad app to help you to understand what choices you have and to decide what you would like your veneers to look like. Next, Dr. Radu will take impressions of your teeth. These will be sent to our high-tech lab in Germany along with all other diagnostic instructions. Using exact computer-aided technology, your porcelain veneer will be milled from high-grade porcelain to precise specifications. Once the veneers have been created, Dr. Radu will slightly etch the targeted teeth so that the veneers will bond strongly when placed. He will then make any minor adjustments needed to be sure your bite is correct and balanced, and the veneer is comfortable. Dental bonding is a more economical alternative to veneers. It can be a good substitute for veneers, although typically not as durable or as stain resistant. Dental bonding utilizes a tooth-colored composite resin that is applied to a tooth, which is then shaped and polished to match surrounding teeth.